Leonard Nimoy and William Shatner first crossed paths as actors on the set of The Man from U.N.C.L.E. Little did they know that their next roles, in a new science-fiction television series, would shape their lives in ways no one could have anticipated. In seventy-nine television episodes and six feature films, they grew to know each other more than most friends could ever Leonard Nimoy and William Shatner first crossed paths as actors on the set of The Man from U.N.C.L.E. Little did they know that their next roles, in a new science-fiction television series, would shape their lives in ways no one could have anticipated. In seventy-nine television episodes and six feature films, they grew to know each other more than most friends could ever imagine. Over the course of half a century, Shatner and Nimoy saw each other through personal and professional highs and lows. In this powerfully emotional book, Shatner tells the story of a man who was his friend for five decades, recounting anecdotes and untold stories of their lives on and off set, as well as gathering stories from others who knew Nimoy well, to present a full picture of a rich life. 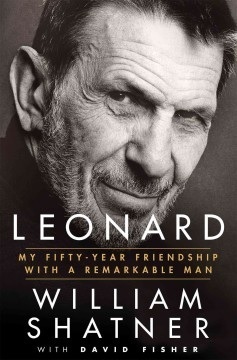 As much a biography of Nimoy as a story of their friendship, Leonard is a uniquely heartfelt book written by one legendary actor in celebration of another.